This article is about the river in the Middle East. For other rivers, see Jordan River (disambiguation). "The Jordan" redirects here. For other uses, see Jordan (disambiguation). The Jordan River or River Jordan (Hebrew: נְהַר הַיַּרְדֵּן, Nahar ha-Yarden; Classical Syriac: ܢܗܪܐ ܕܝܘܪܕܢܢ‎, Arabic: نَهْر الْأُرْدُنّ‎, Nahr al-Urdunn; Ancient Greek: Ιορδάνης, Iordànes) is a 251-kilometre-long (156 mi) river in the Middle East that flows roughly north to south through the Sea of Galilee (Hebrew: כנרת Kinneret, Arabic: Bohayrat Tabaraya, meaning Lake of Tiberias) and on to the Dead Sea. Jordan and the Golan Heights border the river to the east, while the West Bank and Israel lie to its west. Both Jordan and the West Bank take their names from the river. 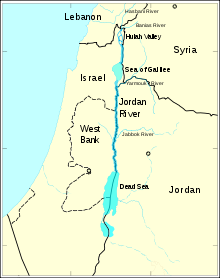 The Jordan River runs along the border between Jordan, the Palestinian West Bank, Israel and southwestern Syria. The river has a major significance in Judaism and Christianity since the Bible says that the Israelites crossed it into the Promised Land and that Jesus of Nazareth was baptised by John the Baptist in it. The Jordan River has an upper course from its sources to the Sea of Galilee, and a lower course south of the Sea of Galilee down to the Dead Sea. In traditional terminology, the upper course (or most of it) is commonly referred to as passing through the "Hula Valley", as opposed to "Upper Jordan Valley"; the Sea of Galilee through which the river passes is a separate entity; and the term Jordan Valley is reserved for the lower course, fed by the Yarmouk and Zarqa Rivers. Over its upper course, fed by the Hasbani River in Banias and Dan, the river drops rapidly in a 75-kilometre (47 mi) run to the once large and swampy Lake Hula, which is slightly above sea level. Exiting the now much-diminished lake, it goes through an even steeper drop over the 25 kilometres (16 mi) down to the Sea of Galilee, which it enters at its northern end. The Jordan deposits much of the silt it is carrying within the lake, which it leaves again near its southern tip. At that point, the river is situated about 210 metres below sea level. The last 120-kilometre (75 mi)-long section follows what is commonly termed the "Jordan Valley", which has less gradient (the total drop is another 210 metres) so that the river meanders before entering the Dead Sea, a terminal lake about 422 metres below sea level with no outlet. Two major tributaries enter from the east during this last section: the Yarmouk River and Zarqa River. Its section north of the Sea of Galilee is within the boundaries of Israel and forms the western boundary of the Golan Heights. South of the lake, it forms the border between the Kingdom of Jordan (to the east), and Israel (to the west). Hasbani (Arabic: الحاصباني Hasbani, Hebrew: either שניר Snir or Hatzbani), a stream which flows from the north-western foot of Mount Hermon in Lebanon. Dan (Arabic: اللدان Leddan, Hebrew: דן Dan), a stream whose source is also at the base of Mount Hermon. Banias (Arabic: بانياس Banias, Hebrew: either Banias or חרמון Hermon), a stream arising from a spring at Banias at the foot of Mount Hermon. While several hypotheses for the origin of the river's name have been proposed, the most accepted is that it comes from Semitic Yard|on 'flow down' <√ירד reflecting the river's declivity. :121 Cognates of the word are found in Aramaic, Hebrew, and other Semitic languages. The first recorded use of the name appears as Yārdon in Anastasi I, an ancient Egyptian papyrus that probably dates to the time of Rameses II. Early Arab chronicles referred to the river as Al-Urdunn. In the 19th century the River Jordan and the Dead Sea were explored by boat primarily by Christopher Costigan in 1835, Thomas Howard Molyneux in 1847, William Francis Lynch in 1848, and John MacGregor in 1869. The full text of W. F. Lynch's 1849 book Narrative of the United States' Expedition to the River Jordan and the Dead Sea is available online. In 1964, Israel began operating a pumping station that diverts water from the Sea of Galilee to the National Water Carrier. Also in 1964, Jordan constructed a channel that diverted water from the Yarmouk River, another main tributary of the Jordan River to the East Ghor Canal. Syria has also built reservoirs that catch the Yarmouk's waters. Environmentalists blame Israel, Jordan and Syria for extensive damage to the Jordan River ecosystem. In modern times, the waters are 70% to 90% used for human purposes and the flow is greatly reduced. Because of this and the high evaporation rate of the Dead Sea, as well as industrial extraction of salts through evaporation ponds, the sea is shrinking. All the shallow waters of the southern end of the sea have been drained in modern times and are now salt flats. A small section of the northernmost portion of the Lower Jordan, the first ca. 3-kilometre (1.9 mi) below the Sea of Galilee, has been kept pristine for baptism and local tourism. Most polluted is the 100-kilometre downstream stretch—a meandering stream from above the confluence with the Yarmouk to the Dead Sea. Environmentalists say the practice of letting sewage and brackish water flow into the river has almost destroyed its ecosystem. Rescuing the Jordan could take decades, according to environmentalists. In 2007, Friends of the Earth Middle East (FoEME) named the Jordan River as one of the world's 100 most endangered ecological sites, due in part to lack of cooperation between Israel and neighboring Arab states. The same environmentalist organization had said in a report that the Jordan River could dry up by 2011 unless the decay was stopped. The flow rate of the Jordan River once was 1.3 billion cubic metres per year; as of 2010, just 20 to 30 million cubic metres per year flow into the Dead Sea. Recent literature shows the role of power asymmetries and of discourses and narratives in shaping hydropolitics along the Jordan River Basin. Route 90, part of which is named after Rehavam Zeevi, connects the northern and southern tips of the Israeli-occupied West Bank and parallels the Jordan River on the western side. There are two border crossings between Israel and Jordan which cross the river over bridges. The northern one, Jordan River Crossing or Sheikh Hussein Bridge is near Beit She'an; the southern one, Allenby Bridge (also King Hussein Bridge), is near Jericho. From the bridges crossing the river within Israel, the most famous one is the Bnot Ya'akov Bridge (Hebrew: Gesher Bnot Ya'akov, "Daughters of Jacob Bridge"). Another closed bridge is the King Abdullah Bridge south of the Allenby Bridge. The waters of the Jordan River are the second largest water resource for Israel, desalination of sea water from the Mediterranean being the first. Israel's National Water Carrier, completed in 1964, delivers water from the Sea of Galilee to the Israeli coastal plain. Jordan receives 50,000,000 cubic metres (1.8×109 cu ft) of water from the river, a quantity which is regulated by the 1994 peace treaty with Israel. In the past, one of the main water resources in Jordan was the Jordan River, with a flow of 1.3 billion m3 per year (BCM/yr). However, after Israel built the National Water Carrier in 1953 and diverted water from Lake Tiberias to Israel’s coastal plains and southern desert, the flow of the Lower Jordan River dropped significantly. The 50 MCM/yr that Israel provides from Lake Tiberias as part of the 1994 peace treaty was meant to compensate for this loss. A 2010 study found that the Lower Jordan River has been reduced to 2% of its historic flow. Water quality has also deteriorated sharply, with high levels of salinity and pollution from agricultural fertilizer and untreated wastewater upstream in Israel and the West Bank. Conflict about the waters of the Jordan River was a contributing factor to the Six-Day War when, starting in 1965, Syria attempted to divert some of its headwaters in collaboration with Lebanon and Jordan. The diversion works would have reduced the water availability for Israel's carrier by about 35%, and Israel's overall water supply by about 11%. In the Hebrew Bible the Jordan is referred to as the source of fertility of a large plain ("Kikkar ha-Yarden"), said to be watered like "the garden of the LORD" (Genesis 13:10). There is no regular description of the Jordan in the Bible; only scattered and indefinite references to it are given. Jacob crossed it and its tributary, the Jabbok (the modern Al-Zarqa), on his way back from Haran (Genesis 32:11, 32:23–24). It is noted as the line of demarcation between the "two tribes and the half tribe" settled to the east (Numbers 34:15) and the "nine tribes and the half tribe of Manasseh" that, led by Joshua, settled to the west (Joshua 13:7, passim). Opposite Jericho, it was called "the Jordan of Jericho" (Numbers 34:15; 35:1). The Jordan has a number of fords, and one of them is famous as the place where many Ephraimites were slain by Jephthah (Judges 12:5–6). It seems that these are the same fords mentioned as being near Beth-barah, where Gideon lay in wait for the Midianites (Judges 7:24). In the plain of the Jordan, between Succoth and Zarthan, is the clay ground where Solomon had his brass-foundries (1 Kings 7:46). In 2 Kings 6:1-4 the Jordan valley is portrayed as a woodland region. Biblical commentator Albert Barnes suggested that "trees were rare in most parts of Palestine, but plentiful in the Jordan Valley". In biblical history, the Jordan appears as the scene of several miracles, the first taking place when the Jordan, near Jericho, was crossed by the Israelites under Joshua (Joshua 3:15–17). Later the two tribes and the half tribe that settled east of the Jordan built a large altar on its banks as "a witness" between them and the other tribes (Joshua 22:10, 22:26, et seq.). The Jordan was crossed by Elijah and Elisha on dry ground (2 Kings 2:8, 2:14). The prophet and wonder-worker Elisha performed two miracles at the Jordan: he healed Naaman's leprosy by having him bathe in its waters (2 Kings 5:14), and he made an axe head lost by one of the "children of the prophets" float, by throwing a piece of wood into the water (2 Kings 6:6). Jordanian Christian women visiting Al-Maghtas site, 28 November 1913. The New Testament states that John the Baptist baptised unto repentance in the Jordan (Matthew 3:5–6; Mark1:5; Luke 3:3; John1:28). These acts of Baptism are also reported as having taken place at Bethabara (John 1:28). Jesus came to be baptised by him there (Matthew 3:13; Mark 1:9; Luke 3:21, 4:1). The Jordan is also where John the Baptist bore record of Jesus as the Son of God and Lamb of God (John 1:29–36). The prophecy of Isaiah regarding the Messiah which names the Jordan (Isaiah 9:1–2) is also reported in Matthew 4:15. The New Testament speaks several times about Jesus crossing the Jordan during his ministry (Matthew 19:1; Mark 10:1), and of believers crossing the Jordan to come hear him preach and to be healed of their diseases (Matthew 4:25; Mark 3:7–8). When his enemies sought to capture him, Jesus took refuge at Jordan in the place John had first baptised (John 10:39–40). Scholars have concluded that the site called Al-Maghtas on the east side has long been considered the location for the Baptism of Jesus and a place of pilgrimage though most current pilgrims go to a location on the west side, Qasr el Yahud, also long established but not as early. This has led to choosing Al-Maghtas as a UNESCO World Heritage site, which took place in 2015. The Jordan is a frequent symbol in folk, gospel, and spiritual music, and in poetic and literary works. Because, according to Jewish tradition, the Israelites made a difficult and hazardous journey from slavery in Egypt to freedom in the Promised Land, the Jordan can refer to freedom. The actual crossing is the final step of the journey, which is then complete. Because of the baptism of Jesus, water from the Jordan is employed for the christening of heirs and princes in several Christian royal houses, such as the cases of Prince George of Cambridge, Simeon of Bulgaria and James Ogilvy. The baptism of Jesus is referred to in a hymn by the reformer Martin Luther, "Christ unser Herr zum Jordan kam" (1541), base for a cantata by Johann Sebastian Bach, Christ unser Herr zum Jordan kam, BWV 7 (1724). The Jordan River, due primarily to its rich spiritual importance, has provided inspiration for countless songs, hymns, and stories, including the traditional African-American spiritual/folk songs "Michael Row the Boat Ashore", "Deep River", and "Roll, Jordan, Roll". It is mentioned in the songs "Eve of Destruction", "Will You Be There", and "The Wayfaring Stranger" and in "Ol' Man River" from the musical Show Boat. "The Far Side Banks of Jordan" by Johnny Cash and June Carter Cash on June's Grammy Award-winning studio album, Press On, mentions the Jordan River as well as the Promised Land. Jordan River is also the subject of roots reggae artist Burning Spear's song of the same title. ^ "An Interfaith Look at the Jordan River". Retrieved 16 January 2017. ^ Essays in Political Geography. Routledge. 2016. p. 260. ISBN 9781317605287. ^ Rahkonen, Pauli Ensio Juhani (11 October 2016). ""Canaanites" or "Amorites"? A Study on Semitic toponyms of the second millenium BC in the Land of Canaan". Studia Orientalia Electronica. 4: 108–130. ISSN 2323-5209. ^ a b Mills, Watson E.; Bullard, Roger Aubrey (1990). Mercer Dictionary of the Bible. Mercer University Press. pp. 466–467, 928. ISBN 9780865543737. Retrieved 15 June 2018. ^ Aḥituv, Shmuel (1984). Canaanite toponyms in ancient Egyptian documents. Magnes Press. p. 123. Retrieved 15 June 2018. ^ Le Strange, Guy (1890). Palestine Under the Moslems: A Description of Syria and the Holy Land from A. D. 650 To 1500. Alexander P. Watt for the Committee of the Palestine Exploration Fund. p. 52. Retrieved 15 June 2018. ^ "History of the Dead Sea - Discover the Dead Sea with Us!". 1 July 2016. Retrieved 16 January 2017. ^ a b Plushnick-Masti, Ramil (10 September 2006). "Raw Sewage Taints Sacred Jordan River". The Washington Post. Retrieved 10 October 2010. ^ a b "Jordan River could die by 2011: report". Retrieved 16 January 2017. ^ Hussein, Hussam, and Mattia Grandi. "Dynamic political contexts and power asymmetries: the cases of the Blue Nile and the Yarmouk Rivers." International Environmental Agreements: Politics, Law and Economics (2017): 1-20. ^ Susskind, Lawrence; Shafiqul Islam (2012). "Water Diplomacy: Creating Value and Building Trust in Transboundary Water Negotiations". Science & Diplomacy. 1 (3). ^ Gafny, Sarig; Talozi, Samer; Al Sheikh, Banan; Ya’ari, Elizabeth. "An Environmental Flows Report on the Rehabilitation of the Lower Jordan River" (PDF). ecopeaceme.org. ^ "Surface and Groundwater of Jordan". Fanack Water. Fanack Water of the Middle East and North Africa. ^ "Appendix C: Historical review of the political riparian issues in the development of the Jordan River and basin management". Murakami. 1995. ^ Centre, UNESCO World Heritage. "Baptism Site "Bethany Beyond the Jordan" (Al-Maghtas)". Retrieved 16 January 2017. ^ Kate Connolly, "Once upon a time in Bulgaria", The Guardian, 20 June 2001. ^ "Jah Lyrics: Burning Spear - Jordan River Lyrics". Retrieved 16 January 2017.